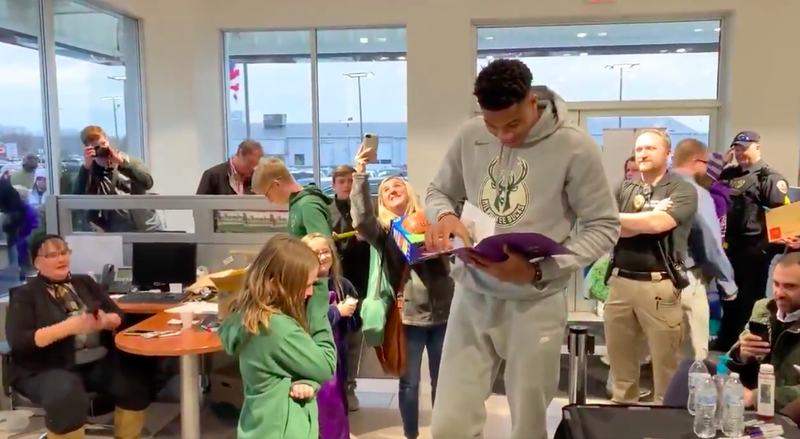 Milwaukee Bucks forward Giannis Antetokounmpo is one of the few people in sports who manages to strike the seemingly impossible balance between being a highly competitive, elite professional athlete—who does extremely rude dunks—and being a genuinely good guy. Just look at what he did when a small fan gave him a year’s worth of her artwork as a present. When Giannis got up to give the little fan a hug, he said, “Thank you so much, this is amazing. It’s amazing. You did all this? Thank you, thank you.” Then she started crying! Aw. May Giannis remain good forever. Maybe Stephen Strasburg Is Doing This On Purpose?